Companies and entrepreneurs are racing to find sustainable alternatives to plastic to cut down on global pollution levels, a target of the United Nations’ Global Goal 12. You can join us in taking action on this issue here. Nearly half a trillion plastic water bottles are purchased and consumed each year, and fewer than 7% are recycled into new water bottles. That means that hundreds of billions of water bottles are diverted into waste streams annually, and a percentage of this total ultimately enters the world’s oceans, where it poses an existential threat to marine life. A new company called Cove wants to make this scenario far less environmentally harmful. Cove has patented a compostable water bottle that dissolves if it ever makes it into a landfill or body of water. 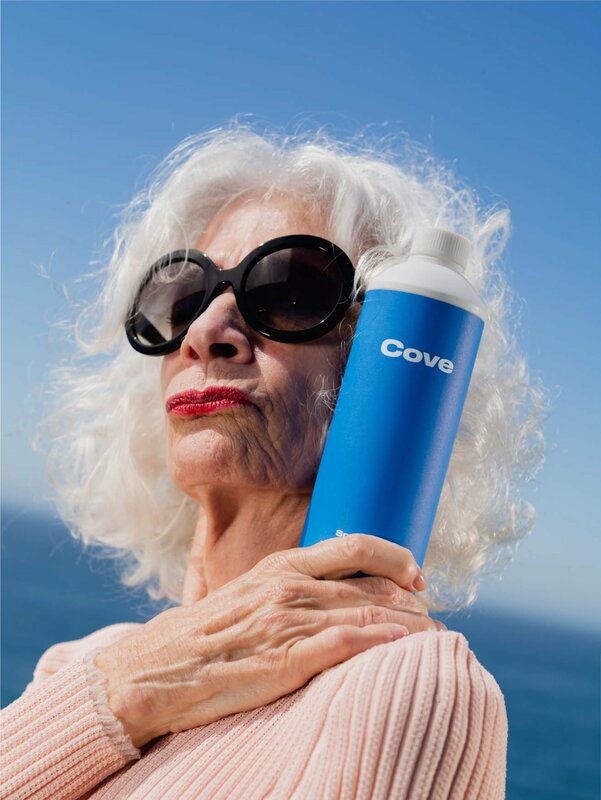 The Cove water bottle is made from a biopolymer called PHA that’s comes from a fermenting bacteria. Once shaped into the final product, the PHA material acts like a regular plastic water bottle, but once it interacts with naturally occurring bacteria in wild environments, it begins to break down. Totterman told Fast Company that he devised this alternative because people have grown to rely on the convenience of plastic bottles. Although many consumers have opted for reusable bottles, the amount of single-use water bottles sold increases every year, which suggests that convenience oftentimes trumps considerations of sustainability. The Cove bottle can satisfy the on-the-go habit of quickly picking up something to drink at a convenience store, while removing the environmental risk of plastic pollution. The global recycling system has come under heavy scrutiny in recent years for its inability to handle the volume of waste being produced each year. Instead of improving these systems, Cove’s product could help countries move beyond what is perceived to be a broken model. The first Cove water bottles will hit the Los Angeles market on Feb. 28 and the company plans to expand in the months and years ahead. The company also plans to source water sustainably and ethically. Other plastic alternatives have emerged in recent years. For example, a beer brand has replaced plastic six-pack rings with recyclable glue, a plastic wrap alternative was created with seashells and plants, and scientists invented a grocery bag that animals can eat. An arm’s race is currently underway among major consumer goods’ brands to find sustainable alternatives to plastic. For example, companies such as Procter & Gamble, Nestle, Unilever, and PepsiCo Inc. recently announced that they’ll piloting a program of reusable containers for various products that will be regularly collected and repurposed. Other companies are getting rid of plastic altogether. Hotel companies, airlines, restaurants, housing goods stores, supermarkets, and clothing brands have all announced plans to phase out single-use plastics. More than 60 countries, meanwhile, have restricted plastic production in some way, and places like the European Union are looking to fully eliminate microplastics. For its part, Cove is not trying to corner the market and conceal its innovations. Instead, Totterman said that he hopes companies will reach out for partnerships. “We’re trying to equip people with the tools to overcome this problem,” he added.